How Far Does the Periodic Table Go? Until December 2015, there were holes in the periodic table, elements synthesized but not yet officially recognized. But as we enter the International Year of the Periodic Table, the classic periodic table has been filled to its seventh row: In late 2015, the International Union of Pure and Applied Chemistry officially confirmed elements 113, 115, 117, and 118. The new elements also received their final names: nihonium, moscovium, tennessine, and oganesson. Efforts to find the next elements, 119 and 120, are underway. The periodic table of elements is a “stalwart symbol” of chemistry, the chemist Eric R. Scerri enthused. “It graces the walls of lecture halls and laboratories of all types, from universities to industry,” he wrote in American Scientist. “It is one of the most powerful icons of science. 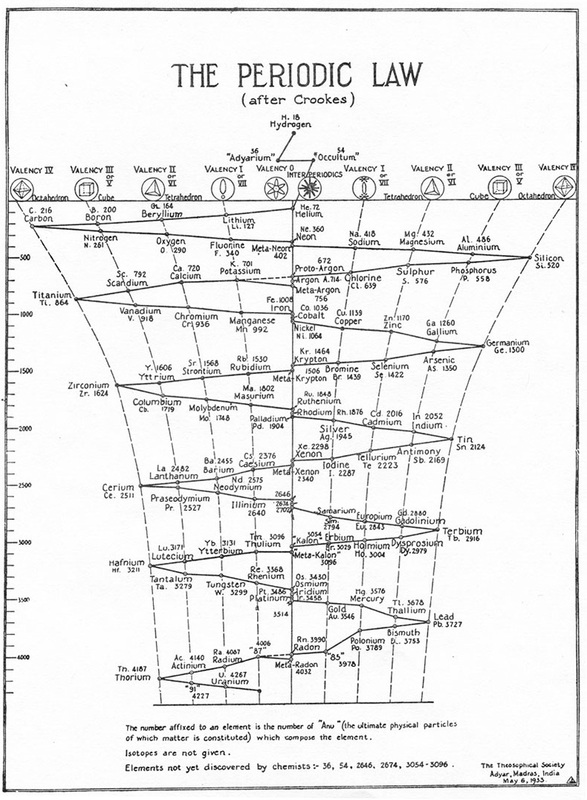 It captures the essence of chemistry in one elegant pattern.” Dmitri Mendeleev first published a scheme to organize all then-known elements in 1869, and this system, although not perfect, became fundamental in the study of chemistry. 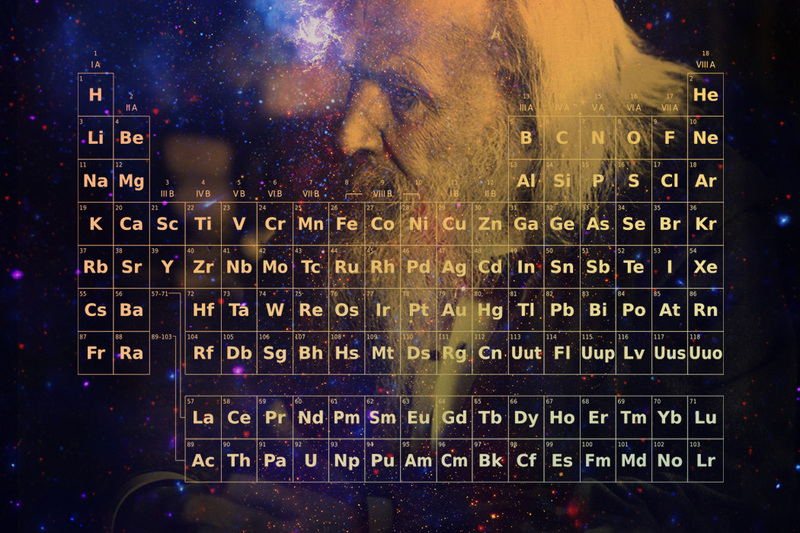 In the beginning, not even Mendeleev recognized the magnitude of his discovery. Mendeleev wasn’t the first to come up with a system to categorize elements, but, Scerri points out, “his version is the one that had the biggest impact on the scientific community.” The periodic table organizes elements by rows according to their atomic number, the number of protons in an atom’s nucleus, and by columns according to the configurations of the atom’s outermost electrons. This configuration usually dictates an element’s “personality” as well as its size and shape. Soft metals like lithium and potassium, which react strongly with others, inhabit one column, while fluorine and iodine, non-metallic reactive elements, live in another. This law is being pushed to its limits as chemists synthesize new elements. Already, as atomic numbers reach ever higher, the chemical properties of some of the new elements do not resemble those of other elements in the same group. This, Scerri writes in a 2013 article for Scientific American, “might undermine the very rationale behind the table’s existence: the recurring patterns that give the periodic table its name.” Exactly how many elements are still to be discovered? 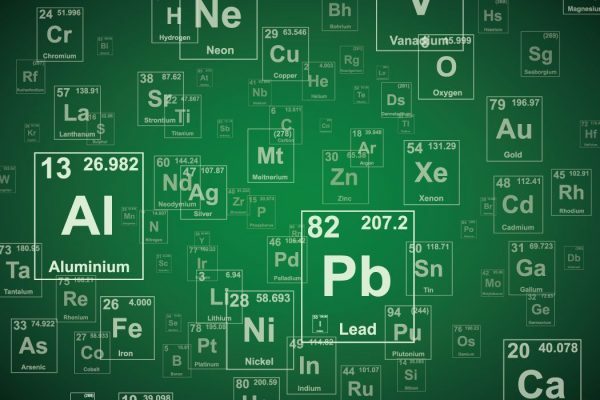 Is there an end to the periodic table? When will we reach it? What does it teach us about the nature of the elements? Until physicists probed around in the debris produced in nuclear reactors and explosions, only 92 naturally occurring elements were known, up to uranium. In radioactive material, physicists found new elements: neptunium, plutonium, americium, einsteinium, and more. Beyond element 100, fermium, however, not even hydrogen bombs were powerful enough to produce new elements, so scientists changed their tactics. Instead of brute force, finesse was the key. Scientists used cyclotrons and accelerators to bring ions of lighter elements to high speed, then fired them at the nuclei of elements with higher atomic numbers. If everything went exactly right, the nuclei of the atoms in the beam and the target fused. The aim: to add a proton and increase the atomic number, thereby making a new element. Fittingly, the first element created this way was named mendelevium. Research centers in the U.S. and Russia, mainly the Lawrence Berkeley National Laboratory and the Joint Institute for Nuclear Research in Dubna, pushed forward in the 1950s, 60s, and 70s. Every few years, a new element would be discovered and named, eventually reaching element 106 (seaborgium). The GSI Helmholtz Centre for Heavy Ion Research (GSI) in Germany got the upper hand as they changed their approach to “cold fusion:” focusing a low-energy beam at a target with a high atomic number led to the discovery of elements from bohrium (107) to copernicium (112). When making new superheavy elements, scientists are engaged in a battle against the fundaments of nature. When making new superheavy elements, scientists are engaged in a battle against the fundaments of nature: In elements with low atomic weight, protons and neutrons stick together because the strong nuclear force pulls them together. But when more and more protons are packed into a nucleus, the strong nuclear force starts to lose out to another force, the Coulomb force. This force causes particles of the same charge to push each other apart. Most superheavy nuclei undergo nuclear fission within milliseconds, splintering into lighter elements, or they spit out a few alpha particles—made of two protons and two neutrons—at first and then split apart. With elements 113 to 118, the discoverers were closing in on a tantalizing goal: the island of stability. Theories predict that when certain “magic” numbers of protons and neutrons are packed in a nucleus, the nucleus becomes more stable and long-lived. Calcium, nickel, tin, and lead have exceptionally stable nuclei, which theorists believe is because these elements have magic numbers of protons and/or neutrons. These “magic numbers” correspond to filled nuclear shells, which could make the nucleus more stable. The elements around where proton and neutron magic numbers would come together, the “island of stability,” is enticing superheavy element researchers. But the island’s precise location in the periodic table is unknown. Some of the newly synthesized elements seem to be more stable: one form of element 117 with 177 neutrons stuck around for 112 milliseconds. The next “magic number” for neutrons is predicted to be 184, but so far, 177 neutrons has been the maximum. Scientists may be getting closer to the shore, but they haven’t reached dry land yet. That’s because producing even a tiny amount of a new superheavy element is a superheavy endeavor. Creating element 117 posed a particular challenge. The only place that produces enough of the target, berkelium, is Oak Ridge National Laboratory, in Tennessee, thousands of miles from Dubna, where Oganessian’s team carried out the collision. Production of berkelium started two years before the experiment in Dubna was scheduled to start. It took 250 days of irradiation to produce enough berkelium, and 90 days of processing to purify it. Then the clock started ticking. Berkelium is radioactive, with a half-life of 327 days. All 22 milligrams of it had to be rushed to JINR during the time window in which the accelerator and beam were available. It worked: 150 days of bombarding the precious berkelium target with calcium created six atoms of element 117. Work on creating element 119, the next superheavy element, started in December 2017 at the RIKEN laboratory in Wako, Japan. Oganessian’s team, in Dubna, is preparing to hunt for 119 from 2019 onwards. As early as 2007, researchers in Dubna and at the GSI in Germany started trying to synthesize element 120. So far, no sign of either element has been found. Efforts to fill row eight of the periodic table could lead to new insights into the physics of atoms. 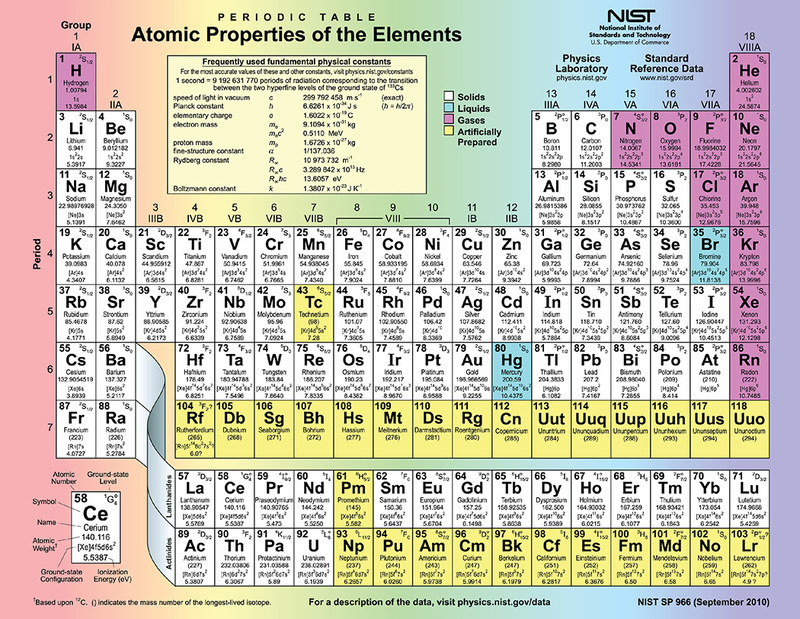 Elements have a periodic pattern in their chemical properties because those properties are determined in large part by the space an atom’s electrons inhabit around its nucleus, especially the outermost region. These regions, mathematically described as “orbitals,” come in a discrete range of sizes and shapes, and the structures of the outer orbitals change in a periodic, or repeating, way. Atoms with different atomic numbers thus can have similar shapes, leading to a repeating or “periodic” pattern of element blocks which have the same outer orbital shapes. With element 121, electrons would occupy an entirely new orbital never encounterd before, the g orbitals. Nobody really knows where the table will end. Richard Feynman predicted that element 137 would be the last one. But nobody really knows where the table will end. Calculations of the table’s end are based on the theory of relativity. When nuclei get larger, more protons in the nucleus mean more force pulling electrons in, so the electrons traveling around them have to go faster and faster, reaching speeds that are a substantial fraction of the speed of light. At these speeds, the electrons become “relativistic,” and the atoms behave differently from what is expected based on their position in the table. Eventually, calculations predict that the electrons would have to travel faster than light, which is impossible. On this basis, some scientists predict that the end may be element 170, since this may be the point at which there are enough protons to ask the electrons to do the impossible. We see some relativistic effects on elements in everyday life. In gold atoms, the electrons whizz around the nucleus at more than half the speed of light. This changes the electrons’ orbitals so that gold absorbs blue light, while photons of all other colors bounce off. We observe white light minus blue light, the distinctive golden-yellow gleam of wedding bands that sets gold apart from the silver-colored elements surrounding it in the periodic table. Will chemical properties in the newly-discovered elements follow periodicity, or will the relativistic effects lead to cracks in the periodic law? As new super-heavies are made in extremely small quantities, chemists cannot investigate them with traditional approaches, like sticking the element into a flask and watching it react with other chemicals. Instead, they are devising experiments to gain simple yes-no answers about their properties, asking, for example, will element 112, at very low temperature, bind to gold like a metal? Will it deposit on ice like a noble gas? Already in the 1990s, early experiments showed that rutherfordium (104) and dubnium (105) do not behave in keeping with their positions in the periodic table. According to the periodic law, the two should behave like the elements directly above them, hafnium and tantalum. Instead, rutherfordium reacts like plutonium, which is quite far away in the periodic table, while dubnium behaves like protactinium, a distant element in the table. But not all super-heavies behave unexpectedly. 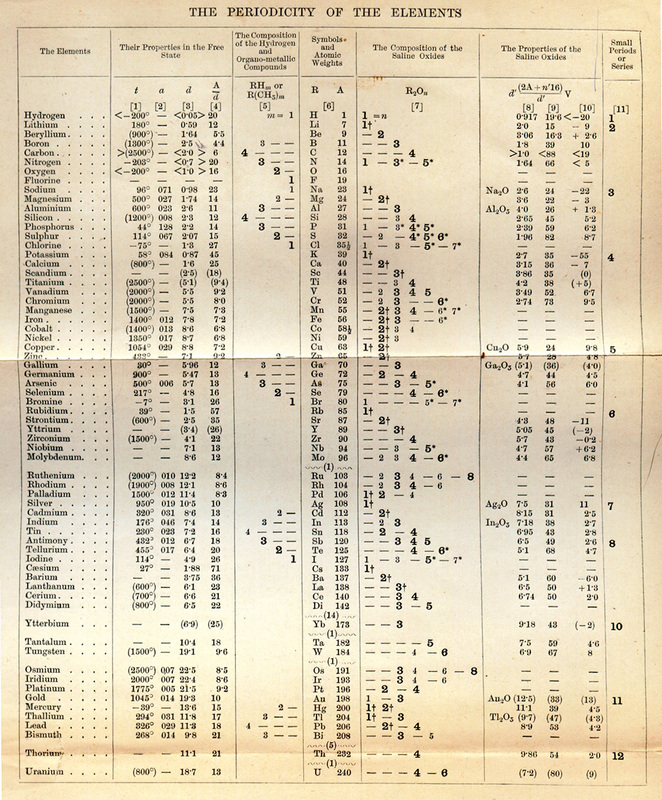 Seaborgium (106) and bohrium (107) act so in keeping with what Mendeleev’s table would have predicted, scholarly papers on them were titled “Oddly Ordinary Seaborgium” and “Boring Bohrium,” Scerri notes. Whether or not the periodic table remains periodic for very heavy atoms is, Scerri admits, “of no great practical consequence, at least for the foreseeable future. The loss of predictive power in the superheavy realm will not affect the usefulness of the rest of the table.” However, “the question of special relativity’s effect strikes at the very heart of chemistry as a discipline.” If the periodic law loses its predictive power due to special relativity, chemistry will be more reliant on physics. But if the periodic law remains (largely) valid, chemistry would keep some independence. Which Way to the Island? Four new elements--113, 115, 117, and 118--have been added to the periodic table. But the search for new elements hasn't always been so systematic.